We're pretty happy to hear your kiddo likes Stranger Things as much as we do. They are such a superfan, in fact, they almost want to visit the Upside Down (don't kid, just don't). And they weren't even that scared watching Season 1...for most of it. There were a few spots where things got a bit tense, but for the most part, your kid kept their cool. But then...the alphabet wall happened. Joyce's crazy Christmas lights experiment actually worked, and your kid's heart pounded and breath quickened as Will communicated a simple message to her: R.U.N. Your kid loved it! How thrilling! But as you might imagine, carrying around an entire wall—complete with 80s wallpaper and carefully placed Chrismas lights—may make trick-or-treating rather cumbersome. 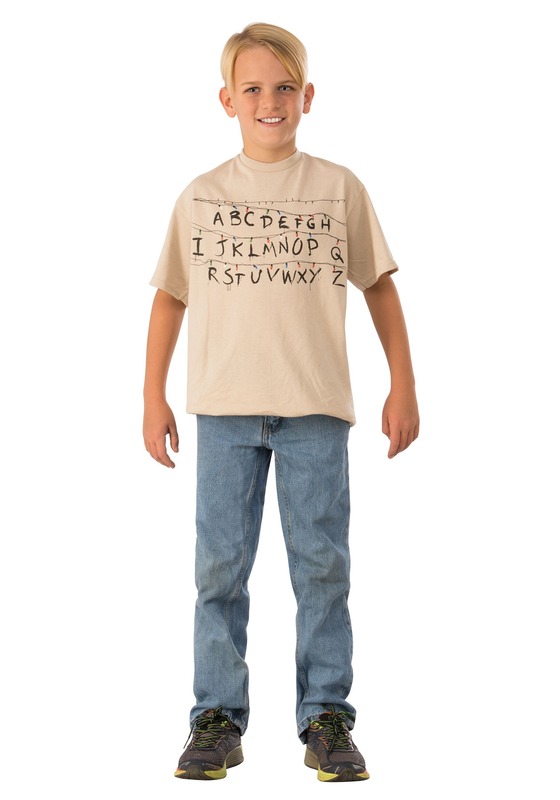 This Child's Alphabet Shirt from Stranger Things, though, is a totally carefree way for your kiddo to show their allegiance to the crew in Hawkins and the nail-biting mysteries unraveling there. The other great thing about this shirt is that it will make it a lot easier to run from Demogorgons and bullies than if they were lugging an actual wall around. It's a tan crew neck shirt with Joyce's now-iconic alphabet print. The letters look hand-painted—just like in the show—and Christmas lights are printed above them. This look is totally for the "in" crowd. Non-fans may say things like, "Cool shirt," or, "Hey, just learning to read?" (jerk), but the show fans will flock to your side to discuss major plot points and to debate whether Steve is actually a good babysitter or not. So whether your kid wants to wear this as part of a group costume and team up with Mike, Will, Dustin, Lucas, and El, or they want to fly solo and eat all the candy themselves, just make sure they don't ride their bike home alone at night, and that they keep a keen eye out for the Demogorgon!